In many parts of the world, having a refrigerator is part of everyday life. But in China, only 7% of people in cities had refrigerators in 1995. Now that number is over 95%. Writer Nicola Twilley has an article in the New York Times about how this simple technology has changed everything. Twilley, who is working on a book project about refrigeration, journeys to Zhengzhou, a city that has become China's unofficial frozen food capital. There, "frozen dumpling billionaire" Chen Zemin quit his day job as a surgeon to become one of the country's first frozen food entrepreneurs. Since then, rival companies have sprung up in the region to compete with his frozen dumpling and rice ball empire. Of course, when you bring refrigeration to a nation of millions, there are always unexpected consequences. Because of his medical background, Chen had an idea for how to extend the life span of his spicy-pork won tons and sweet-sesame-paste-filled balls. "As a surgeon, you have to preserve things like organs or blood in a cold environment," Chen said. "A surgeon's career cannot be separate from refrigeration. I already knew that cold was the best physical way to preserve." Using mechanical parts harvested from the hospital junk pile, Chen built a two-stage freezer that chilled his glutinous rice balls one by one, quickly enough that large ice crystals didn't form inside the filling and ruin the texture. His first patent covered a production process for the balls themselves; a second was for the packaging that would protect them from freezer burn. Soon enough, Chen realized that both innovations could be applied to pot stickers, too. And so in 1992, against the advice of his entire family, Chen, then 50, quit his hospital job, rented a small former print shop and started China's first frozen-food business. He named his fledgling dumpling company Sanquan, which is short for the "Third Plenary Session of the 11th Central Committee of the Communist Party of China" — the 1978 gathering that marked the country's first steps toward the open market. Today, Sanquan has seven factories nationwide. The largest, in which Chen and I were chatting, employs 5,000 workers and produces an astonishing 400 tons of dumplings a day. 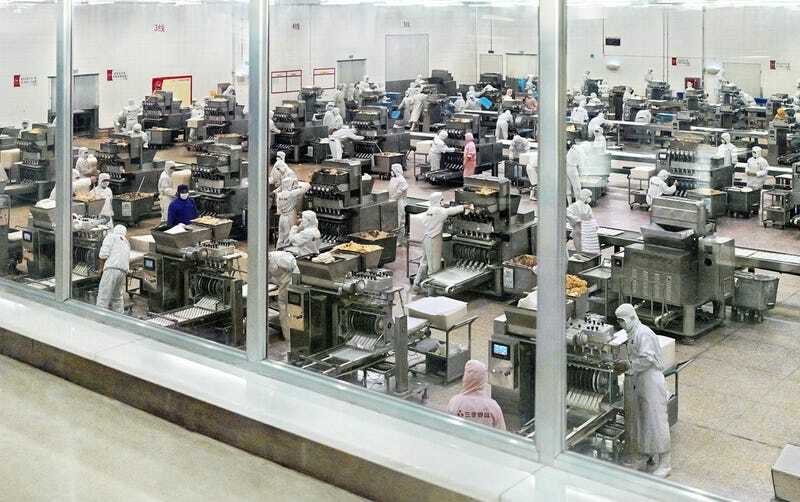 He showed me the factory floor from a glass-walled skywalk; below us, dozens of workers — in hooded white jumpsuits, white face masks and white galoshes — tended to nearly 100 dumpling machines lined up in rows inside a vast, white-tiled refrigerator. Every few minutes, someone in a pink jumpsuit would wheel a fresh vat of ground pork through the stainless-steel double doors in the corner and use a shovel to top off the giant conical funnel on each dumpling maker. In the far corner, a quality-control inspector in a yellow jumpsuit was dealing with a recalcitrant machine, scooping defective dumplings off the conveyor belt with both hands. At the end of the line, more than 100,000 dumplings an hour rained like beige pebbles into an endless succession of open-mouthed bags. Scenes like this are being replicated all over Zhengzhou — a smoggy industrial city that, thanks to Chen's ingenuity, has become the capital of frozen food in China. Sanquan's rival, Synear, was founded in Zhengzhou in 1997, and the two companies account for nearly two-thirds of the country's frozen-food market. The city is home to five of the 10 biggest Chinese-owned companies in the industry, according to the weekly Frozen Food Newspaper, the industry's only trade publication, which is also based in Zhengzhou. Growth has been especially rapid recently, with sales volume doubling in the past five years and expected to double again within the next five. This is not simply transforming how Chinese people grow, distribute and consume food. It also stands to become a formidable new factor in climate change; cooling is already responsible for 15 percent of all electricity consumption worldwide, and leaks of chemical refrigerants are a major source of greenhouse-gas pollution. Read the rest of Twilley's fascinating article in the New York Times.